Enhanced productivity is by far, the biggest benefit that an HRMS software can bring to your organization. Well, it’s simply because implementation of HRMS software leads to the automation of the countless functions that the HR department is entrusted with, including the mammoth tasks of payroll management and tracking leave and attendance of hundreds of employees. This can drastically reduce the amount of paperwork required by the HR personnel, thus improving the productivity. Most large organizations have a host of benefits for their employees, ranging from paid time-offs to insurance and retirement benefits. With an automated HRMS software in place, the employees can easily log in to the HRMS portal, update information and check the status of their benefits, such as bonus and incentives, and even apply for appraisals. This can make the employee feel more in control and leads to a boost in employee morale. Just as we discussed earlier, management of the HR functions on paper can be a mammoth task that leaves a lot of scope for errors. Automation of the HR process, on the other hand, can drastically reduce the chance of errors, thus helping organizations avoid the hassles caused by errors, and enjoy the benefits of a smooth working system. Important business decisions are made based on analysis of data and information, be it about the internal workings of the organization or that about the market. HRMS software ensures information on every aspect of human resources is up to date and the built-in data analysis function of an HRMS software makes it easy for HR personnel to gain key insights from the large amount of employee data. Given below is a screenshot of static reports generated by Digital HRMS. The software enables the HR manager to provide the C-Level decision makers of the organization the information required for effective decision-making. In addition to that, the HRMS software also helps you figure out training requirements for employees across departments, plan induction for new joiners, and more. 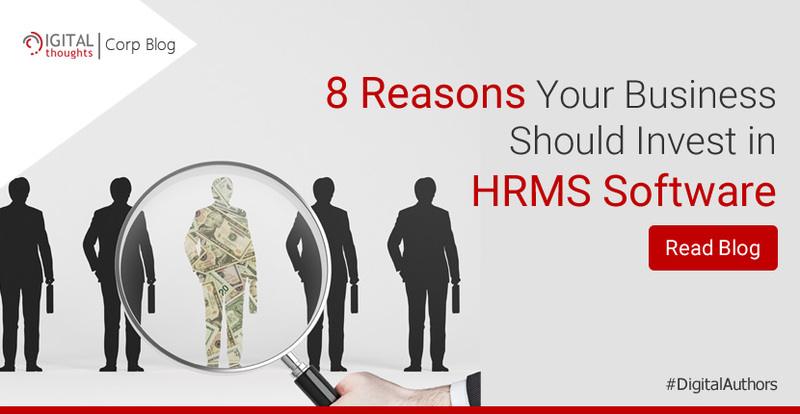 A HRMS software will help you cut down on everyday costs and achieve an increased ROI. It helps you drastically cuts down paperwork, thus saving you time and money. It helps you save on labour costs as most of the functions are taken care of by the software itself. Also, you save on the cost of physically storing your documents containing the data for hundreds of employees, and you have a winning solution at hand. The software can store all the relevant information, including documentation, payroll, employee information, and much more, digitally and at a fraction of the cost of physical storage. In the absence of controlled access, information can never be secure, because it makes the most sensitive information vulnerable to unauthorized access. In scenarios where data is accessed by multiple users, security is of the highest priority and this is where an HRMS system can step in to fill the gap. An HRMS system provides controlled access, which means each employee can see what the admin gives them access to, with only the super-admin enjoying the rights to access all information in the system. When organizations use paper-based systems to keep track of employee information, such as leaves applied for, attendance details, and employment details, it can get difficult for the HR or admin to find the right data at the right time. The additional time taken to find the desired information leads to reduced efficiency and switching to a HRMS software can be the ideal solution to this problem, as it allows the use of filters and search options to find accurate results in less time. Also, a good HRMS software allows you to draw automatic reports that help you to better analyse data and make use of it for important business decisions. One of the biggest advantages of using an HRMS software is the seamless management of employee work hours, attendance and leave to prevent discrepancies. With hundreds of employees working in an organization, keeping a track of their leave and attendance can be difficult with a manual system. To make matters worse, errors in calculating the time, attendance and leave can cost the organization money or even lead to employee demotivation. The automation of time, attendance and leave management that a HRMS software brings in, can benefit the organization in more ways than one. To begin with, it gives the employees the power to keep a tab on their work hours in real time every day, as the software updates info from biometric or RF cards into the system. What’s more, it’s even easier for managers to approve leave requests and the HR to detect any errors in the data and prevent payroll frauds. Please note that I’ve updated the content to make the blog applicable for use in social media. With automated HR processes introduced by the HRMS software taking care of most of the HR functions, the HR personnel in your organization are relieved of the lion’s share of manual work, and they are left with more time and enthusiasm to focus on more important tasks. Digital HRMS is one HRMS software that offers all the above benefits and more. To request a Free Demo, visit www.digitalhrms.com.